This delightful spot is found in the Pureora Forest Park in the Central North Island of New Zealand. 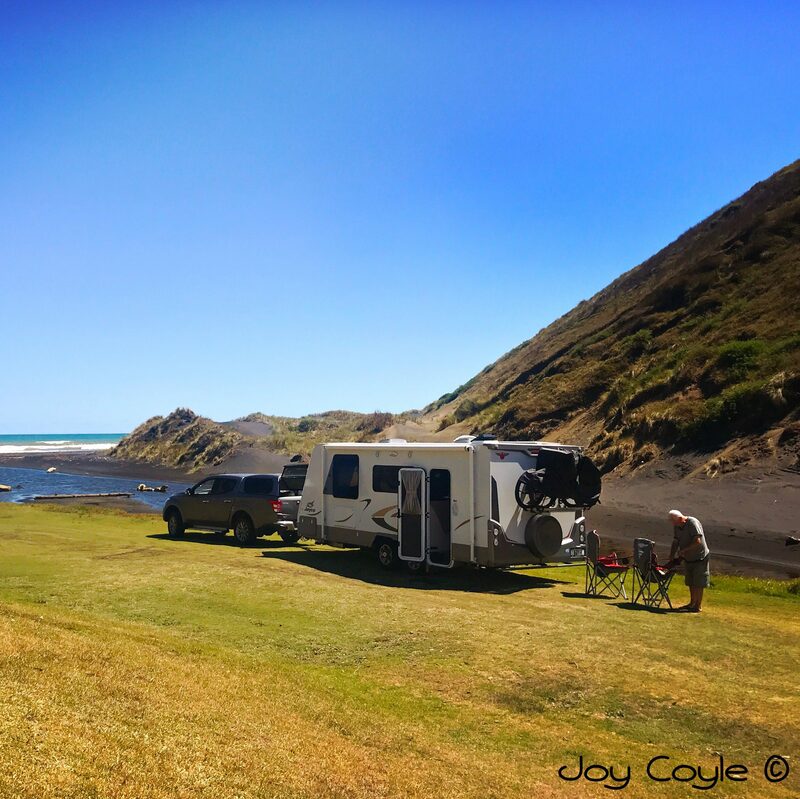 It’s about an hour’s drive from Taupo, around the western side of the lake, and yesterday being such a beautiful day, we thought we’d go find it. It’s hidden away down a 7 km dirt road off SH32. Along these country roads it’s all farmland, not a shop for miles. So when we came upon the Tihoi Tavern in the middle of nowhere so to speak, we thought we’d stop for a coffee and something to eat, not to mention a restroom stop (in case there wasn’t one in the forest). You can see that it’s multipurpose, and if feedback on TripAdvisor is anything to go by, it comes highly recommended. It’s also an NZMCA Park over Property (#3295). Inside, the atmosphere is warm and the decor country tavern style, reflecting the logging and timber history of the area. Old chainsaws are displayed on the ceiling and walls, along with old photographs, newspaper cuttings, and hunting trophies. I, in particular, am glad we stopped here, as when we got to the forest there were no toilet facilities to be seen, not even a long-drop (Kiwi slang for pit toilet or outhouse). So a little further south on SH32, we see the turn off for the lagoon signposted. This road is more like a narrow dirt track, rutted and muddy in places at this time of the year, being winter still. Much better suited to SUV and 4×4 type vehicles, and unsuitable for large motorhomes/RV type vehicles. Our Mitsubishi Triton ute handled it well but passing other vehicles is tricky. We passed one small van coming the other way, fortunately on a part of the track that was slightly wider. After travelling this road for 7 kms we arrived at the carpark – a grass covered area big enough for 6-8 vehicles. The track to the lagoon leads off this. It’s only a 600 metre walk to the lagoon through beautiful lush forest, tall trees and gorgeously green undergrowth. I just love bush walks like this. I wish you could hear the birdsong and feel the cool air of the forest. This rain-fed lagoon is how primeval New Zealand would have looked. The huge eruption that created Lake Taupo 1800 years ago covered the Pureora Forest with a dense layer of volcanic ash, and the depression in the ground level here allowed a lagoon to form and become a rare ephemeral wetland that is entirely fed by rain water. Because of this, in dry weather the lagoon can be little more than a puddle in the middle. This winter we’ve had lots of rain, so it’s a perfect time to come. The towering rimu and kahikatea trees around the perimeter are reflected in the water, which is extremely clear and pure. There are no fish because of the fluctuating water levels, but tadpoles emerging as golden bell frogs thrive here. Rare plant species grow in and around the lagoon, the more fragile water-loving spike-sedge growing in the middle where it’s less likely to dry out. The boardwalk allows us to view the lagoon without damaging plant life, or getting our feet wet. Signs advising viewers to keep off the turf to protect the plants are submerged in the water the day we visit, such has been the rainfall over the last few months. The reflections are just WOW! This place is truly a hidden gem in the heart of the Pureora Forest Park and I absolutely loved it! We decide to return to Taupo via Kinloch, so we turn off SH32 into Whangamata Rd, and eventually arrive at the Kinloch turn off. Kinloch always evokes lots of memories of past family picnics for me. We’ve been coming to this lakeside paradise since the 1980s. Even in winter there’s something to look at near the boat marina. The lakeside community of Kinloch is situated in Whangamata Bay, Lake Taupo, and is about 20 mins drive from Taupo town district. Simply beautiful Joy, amazing! Very well written and lovely photos.